High Security Tokens Eliminate Crossplay & Counterfeits! Proven in carwashes, arcades, laundries, and casinos world wide, X-Mark Site Secure Tokens in combination with X10 Xeptors® stop counterfeit slugs and crossplay tokens in their tracks. The X-Mark is a machine readable optical mark minted directly into the surface of a token in a circular band near it’s periphery. It is also an attractive addition to the appearance of the token. The X-Mark token may not be duplicated by simple means of pressing a real X-Mark token into soft metal or by cutting grooves with a lathe. Because there are numerous distinguishable types of X-Mark tokens for each token diameter and alloy, the X-Mark provides greater security from slugging and unwanted crossplay while opening new promotional token marketing opportunities. 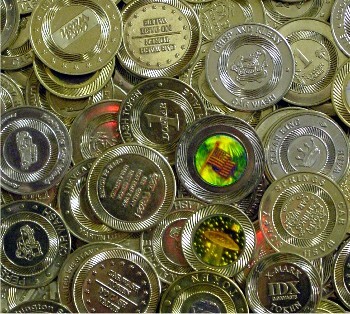 IDX markets and sells X-Mark Site Secure Tokens made to our specs by Osborne Coinage, the exclusively licensed mint under the IDX patents. Osborne uses calibrated optical test equipment to check X-Mark tokens against rigid specifications, as they are minted, to ensure the quality of the minted mark and to intrinsically guarantee that tokens as minted by Osborne will function with the X-10 Xeptors as manufactured by IDX. Each X-Mark Xeptor is configured to read three of the dozens of X-Mark codes. This allows an establishment to selectively accept tokens from a sister property or to allow use of promotional tokens on special occasions or on special machines. Mean No More Crossplay – Guaranteed! Only the advanced technology of the IDX X-10 Xeptors and X-Mark Site Secure Tokens can truly eliminate token crossplay and slugging because IDX owns the patent on this technology and tracks and controls which coded tokens are sold where. The other so-called security tokens are little different from a moving target… it may be good today, but what about tomorrow? Other token dealers neither keep a database for crosschecking future sales, nor can they control the token sales of other mints and distributors capable of providing the same thing. That is why only IDX can guarantee that there never will be a duplicate token sold within 100 miles of your establishment, and only IDX can guarantee that when your X-10 Xeptor is setup correctly for use with your X-Mark Site Secure tokens, there will be no acceptance of crossplay tokens or slugs.